It’s a great pleasure and honor to be in China again, this time for the 21st Century Learning @ the West Lake Expo held Oct 31 – Nov 3, 2009 in Hangzhou, China. This is my 3rd visit to China– I was in Hong Kong this past September, and in Shanghai in 2007. This current visit to China has brought home a problem I encountered in 2007 but did not address adequately at the time: The wiki website I use to share my presentation and workshop handouts is blocked by the Chinese government. This isn’t a personal issue the government’s censors have with me– it stems from the fact that I use the wiki website PBworks, formerly PBwiki, to share my presentation resources, and that particular wiki site is blocked in China. For some reason, other popular wiki sites like WikiSpaces and WetPaint are not blocked in China. Google Sites, unfortunately, IS also blocked. Since I want to provide all the participants at this conference, as well as others who may be interested in the content there, with unfettered digital access to my ideas, this content filtering situation is very problematic and troubling. I am very thankful my main blog site is accessible / not blocked in China, but a LOT of the resources I share are on my presentation wiki, so this blocking situation is really frustrating. Several years ago, I mapped my PBworks website to my personal domain, so the site is accessible (assuming content filters don’t get in the way) from the URLS teachdigital.pbworks.com and handouts.wesfryer.com. This subdomain mapping functionality provides an easier-to-remember website address for my handouts page, but does NOT help circumvent content filtering situations like we have here in China. My guess is that the Chinese content filter is blocking PBworks sites by IP address, not simply by domain name, so even when people try to access my handouts.wesfryer.com site from China it is blocked just as the main/default teachdigital.pbworks.com site is. In 2007, when I was in China for the Learning 2.0 Conference in Shanghai, I created a partial “mirror” of my wiki site on Wikispaces, since for some reason Wikispaces is NOT blocked by the Chinese government but PBworks is. I created the website teachdigital2.wikispaces.com to share my session resources in 2007, but have not made any updates to that site since that time. The following are some of the websites I’ve tried to use since I’ve been in China this week, but have not been able to access without a proxy server since they are BLOCKED by the Chinese government. See my posts from September 2007, “Working behind the great firewall of China” and, “Content filtering in Communist China versus an Oklahoma school” for more on my past experiences dealing with these issues, as well as some troubling behavioral parallels we see between the Chinese government and the leaders of many public school districts in the United States. 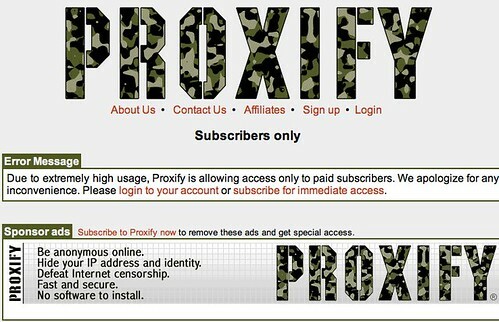 In 2007, Jeff Utecht had recommended at that time I use the website Proxify to access websites blocked by the great firewall of China. As in 2007, this website works pretty well in 2009 for accessing all of the above “blocked” websites. 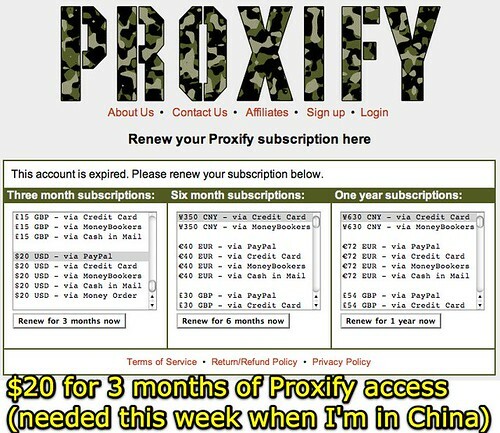 Proxify is not free, so I had to pay $20 US for 3 months of access to use it. I know there are MANY other choices for proxy servers, but since Proxify is one I’ve used previously with success I went with it again for this visit. For some reason I was not able to successfully edit my PBworks site, but I could access it via the proxy service. 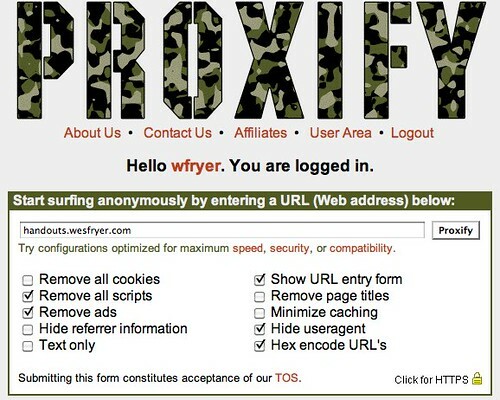 Here is my dilemma: While China’s content filter can be fairly readily bypassed with a proxy like Proxify, there are certainly large numbers of people online today in China who are NOT using proxy sites. 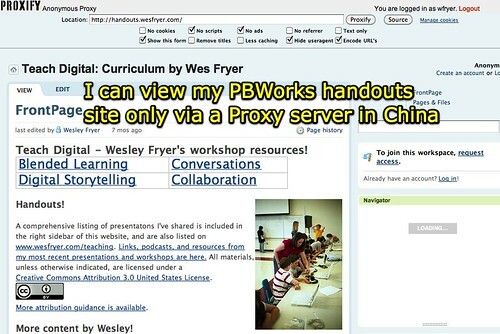 If I used a wiki site like WikiSpaces or Wetpaint, instead of PBworks or Google Sites, I could (at least today) provide people in China with direct access to my workshop curricula / resources. A second option, and perhaps a more durable option (since the Chinese government could decide to block other commercial wiki sites at any time, without warning) would be to run an open source wiki platform like TikiWiki or MediaWiki on my own website, and post presentation / workshop handouts there. As a bit of a sandbox, about a year ago I installed TikiWiki on with my main blog host and created a site for dissertation materials I was using at the time. I’ve also installed MediaWiki on our Storychasers site, again as more of a sandbox than anything else, to see how the interface works and what functionality it offers. I love using PBworks, and definitely think it is functionally superior to either TikiWiki or MediaWiki in the last iterations I tried, but these content filtering issues provide a pretty compelling reason to consider abandoning it in favor of a more accessible wiki option. Does anyone know why PBworks is blocked in China? I wonder if this stems from a particular PBworks website that was built with content the Chinese government censors found offensive, and as a result of that site the entire PBworks domain was blocked? I’d love to find out the answer to this question. If I have to copy all the content from my current handouts site to another one, I’ll probably outsource the work using a web service like Get a Freelancer. Since I learned about sites like this from Mark Wagner at NECC09, I’ve wanted to find a reason to give them a try. Even if that website copying/duplication process is outsourced, however, I’d still face the challenge of using a comparatively weaker/less capable wiki platform for my site like TikiWiki or MediaWiki rather than PBworks of I make this change. I’m not eager to do that. I welcome any input and suggestions you have on this dilemma. To answer your question, since PBworks is an open platform, there are certain public wikis that the Chinese government objects to, largely protest/Falun Gong wikis. Since we don’t censor our users, the result is that for several years, PBworks has been blocked behind the Great Firewall of China. While we’d love for the situation to change, we’re committed to free speech, and won’t terminate our users for exercising that right. Hopefully, the government censors will change their mind in the future. The main reason most sites get blocked in China is not due to their content but accidentally. From what I understand the Chinese gov’t filters by IP address and/or domain names (DNS). A lot of the politically “sensitive” content is hosted on shared hosting servers outside of China (mostly in North America/Europe) and as anyone with technical expertise in virtual hosting/shared hosting knows, the IP addresses can be the same but the domain can be different via virtual hosting/virtual directories (a la Apache/lighttpd/IIS/etc). This is how cheap shared hosting services operate as a business model. I’m not going to get into Chinese politics but the system more or less is a reactive system encouraging self censorship. A quick definition of “politically sensitive” is anything that is critical of the Chinese government for example or anything that challenges the “stability” of the govt. Anyone with the knowledge can easily get around it. It can easily be bypassed using VPNs/proxies. VPNs are more effective since they have a legitimate use in multinational corporations operating in China. The most effective way to bypass it is to use a VPN to somewhere where there isn’t censorship. (North America, HK, Japan, SK, SG, MY, TW, etc…) This is NOT a practical solution to the end user though. As to online content of your users in China, I recommend setting up/moving the content to a server that hopefully has a dedicated IP address that isn’t shared by thousands of other virtual hosts. The wiki hosting service you use probably on the same IP address had something “sensitive” as mentioned above. If you have access to a server or IP used by a .edu hostname it’s MUCH less likely to get filtered than one with commercial attributes (like the free/paid wiki hosting companies you mentioned). Thanks Chris, I figured the reason must have something to do with groups that have protested against the Chinese government, involve Taiwan, etc. Not surprisingly, although the English WikiPedia overall is accessible/not blocked by the Chinese censors, the wiki page for Falun Gong IS blocked here too. I appreciate your stand for free speech, and hope the censors here will change their minds at some point. I’m not going to hold my breath, however. Will: Thanks so much for your reply and suggestions. My blog is now hosted on a VPS and I think that means I have a dedicated IP, rather than a shared IP like I did when I was on a shared hosting account. As Chris confirmed above, however, the issue is with some content hosted by PBworks in this case. Yes, Hangzhou is absolutely beautiful! We’re looking forward to seeing more tomorrow. Hi Wes – When I was in China last year my own blog (learningismessy.com/blog) was blocked … again it was explained to me that the specific server my blog is hosted on at SiteGround is probably blocked due to a site on it that China chooses to block. I was able to get around it by using the blogging feature on Flickr to write to my blog. I couldn’t see the final result until I got outside of China, but it worked well enough … you can see that all my blog posts from there have a Flickr photo on them for that reason. Now….you know how frustrated you where…try living there….no try teaching there for a whole school year. I truly believe those that teach in China are some of the most innovative teachers around. Teachers that want to use tools, get excited to use tools and find out they’re blocked weeks later. Visiting is difficult….living there even harder. It’s only going to get worse I predict as the Chinese web space continues to grow at a rapped pace. As soon as they’re are enough sites internally in China I can see them all but cutting off the access to the outside world. I mean if all your websites are in Chinese and everyone in your counties….all 1.??? Billion of them you’ve got years of grown ahead of you. Very interesting thoughts Jeff. The most interesting part of China and the Internet is that I think as the society and dynamic evolves and changes, naturally I believe it will get more open. Part of it is simply the dynamics of Chinese history/thinking of authoritarianism due to in part of what happened in the mid turn of the 20th century. (Wars, riots, lack of stability, etc…). The good part is that the traditional “static-memorization-testing” model is starting to get questioned as the society gets more free and open. Lots of things, some dramatic have changed since the start of reforms by Deng Xiaoping. I will have to say that as someone who has experienced both mindsets, there are both advantages and disadvantages to both. (Western and Eastern). Remember China still has a large rural population and the ruling party wants stability above all else. From a Western mindset it definitely is different and I can see both points of view.